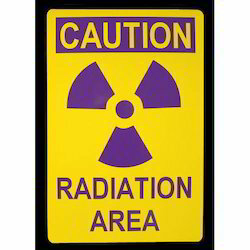 Our range of products include radiation warning sign boards. We are a renowned organization that is engaged in manufacturing and supplying finest quality Radiation Warning Sign Boards. These sign boards are manufactured keeping in mind the variegated requirements of our respectable clients. All these products are offered in sticker and flag forms in paper/PVC in different languages.